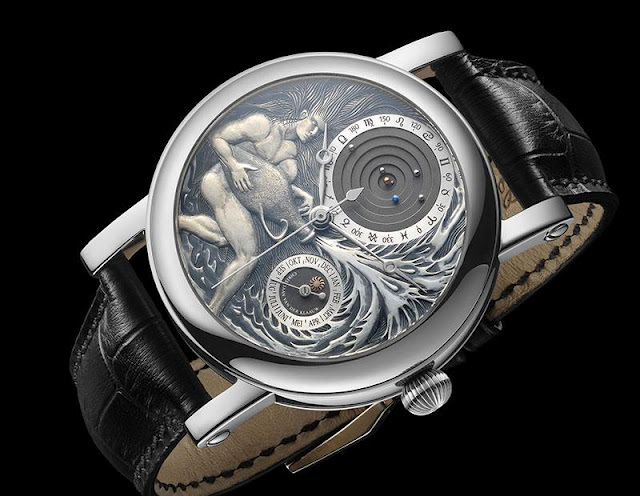 In an extravagant and bold segue from his Planetarium watch, touted as the world’s smallest functioning planetarium, Dutch watchmaker Christiaan Van Der Klaauw has combined with master-engraver Kees Engelbarts for a mashup of astrology with astronomy, resulting in the first of twelve pièce unique, the Aquarius Planetarium. Based on the Planetarium, but really not resembling it at all, the Aquarius’ dial is dominated by an amazingly intricate depiction of this astrological sign in white gold. At 12 o’clock is the well-known planetarium, showing the cycles around the sun of the revolving Mercury, Venus, Earth, Mars, Jupiter and Saturn. On the outer most ring of the planetarium are the astrological positions marked in black on a metallic finish base. At 5 o’clock is a matte finished sub dial identifying the month and the position of the sun. The time (hours, minutes, seconds) hands are carry on the matte theme, which means that they blend somewhat into the engraving work.